Whether you just started working or you're nearly done, you can still potentially grow your nest egg. When planning for retirement, the truth is that the earlier you start saving and investing, the better off you'll be, thanks to the power of compound interest. And even if you began saving late or have yet to begin, it's important to know that you are not alone, and there are steps you can take to increase your retirement savings. "It's never too late to get started," says Debra Greenberg, director, IRA product management, Bank of America Merrill Lynch. Consider the following tips, which can help you boost your savings — no matter what your current stage of life — and pursue the retirement you envision. Especially if you're just beginning to put money away for retirement, start saving and investing as much as you can now, and let compound interest — the ability of your assets to generate earnings, which are reinvested to generate their own earnings — have an opportunity to work in your favor. "The more you can invest when you're young, the better off you'll be," Greenberg says. If your employer offers a traditional 401(k) plan and you are eligible, it allows you to contribute pre-tax money, which can be a significant advantage. Say you're in the 12% tax bracket and plan to contribute $100 per pay period. Since that money comes out of your paycheck before federal income taxes are assessed, your take-home pay will drop by only $88 (plus the amount of applicable state and local income tax and Social Security and Medicare tax). That means you can invest more of your income without feeling it as much in your monthly budget.Footnote 1 If your employer offers a Roth 401(k) feature, which uses income after taxes rather than pre-tax funds, you should consider what your income tax bracket will be in retirement to help you decide whether this is the right choice for you. Even if you leave that employer, you have choices on what to do with your 401(k) account. If your employer offers to match your 401(k) plan contributions, make sure you contribute at least enough to take full advantage of the match, Greenberg says. For example, an employer may offer to match 50% of employee contributions up to 5% of your salary. That means if you earn $50,000 a year and contribute $2,500 to your retirement plan, your employer would kick in another $1,250. It's essentially free money. Don't leave it on the table. Consider establishing an individual retirement account (IRA) to help build your nest egg. You have two options: Traditional IRA may be right for you depending on your income and whether you and/or your spouse have a workplace retirement plan. Contributions to a Traditional IRA may be tax-deductible (see tax deductibility) and the investment earnings have the opportunity to grow tax-deferred until you make withdrawals during retirement. If you meet the phased out income limits, which are based on your federal tax filing status, Roth IRAs may be a good choice for you.Footnote 2 They are funded with after-tax contributions, so once you have turned age 59½, qualified distributions, including earnings, are federal-tax-free (and may be state-tax-free) if certain holding period requirements are satisfied. To determine what type of IRA would work best for you, go to Find out which IRA may be right for you and also check the Contribution Limits chart, below. 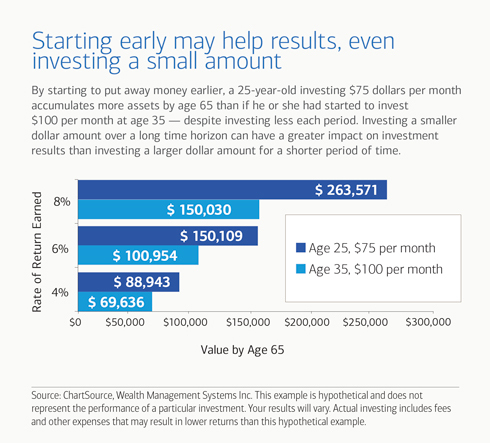 One of the reasons it's important to start saving early if you can is that yearly contributions to IRAs and 401(k) plans are limited. The good news? As of the calendar year you reach age 50, you're eligible to go beyond the normal limits with catch-up contributions to IRAs and 401(k)s.Footnote 3 So if over the years, you haven't been able to save as much as you would have liked, catch-up contributions can help boost your retirement savings. Take a look at the chart, below, for contribution limits for individuals turning age 50 or over in 2018 or 2019. 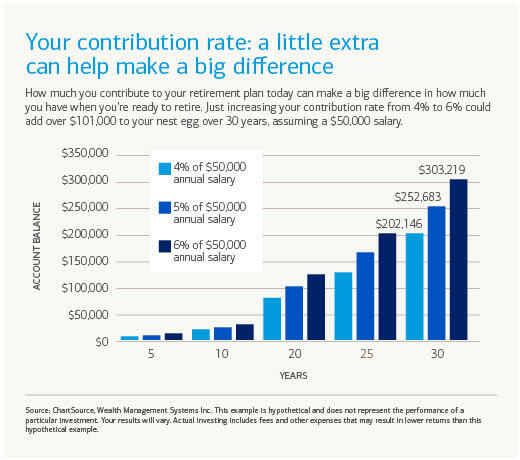 Aim to increase your retirement contributions up to the maximum allowed in your 401(k), IRA or other retirement plans. Examine your budget. You might negotiate a lower rate on your car insurance or save by bringing your lunch to work instead of buying it. Merrill Edge® has an online Determine where your money is going by using our budget worksheet and Determine where your money is going by using our cash flow calculator that can help you determine where your money is going — and find places to reduce spending so you have more to save or invest. Knowing how much you'll need not only makes the process of saving and investing easier but also can make it more rewarding. Set benchmarks along the way, and gain satisfaction as you pursue your retirement goal. Use the Merrill Edge® Find out if you're on track for retirement by using our Personal Retirement Calculator to help determine at what age you may be able to retire and how much you may need to invest and save to do so. Extra money? Don't just spend it. Every time you receive a raise, increase your contribution percentage. Dedicate at least half of the new money to your retirement plan. And while it may be tempting to take that tax refund or salary bonus and splurge on a new designer purse or a vacation, "don't treat those extra funds as found money," Greenberg says. She advises that you treat yourself to something small and use the rest to help make big leaps toward your retirement goal. "This is a big one," Greenberg says. "For every year you can delay receiving a Social Security payment before you reach age 70, you can increase the amount you receive in the future." Age 62 is the earliest you can begin receiving Social Security retirement benefits, but for each year you wait (until age 70), your monthly benefit will increase, and the additional income adds up quickly. Pushing your retirement back even one year could make a significant difference.Footnote 5 It can also increase potential future survivor benefits for your spouse. "Recognizing the need to put money away for retirement is the first step," Greenberg says. Understand how much you want to sock away for retirement, and find creative ways to increase your contributions. According to one study, starting too late and saving too little topped retirees' list of regrets. Making the effort now will help make your retirement something to look forward to and help you View the article stop worrying about retirement. Footnote 1 Income tax will be due upon withdrawal and you may be subject to a 10% additional federal tax for withdrawals prior to age 59½. Footnote 2 Contributions to Roth IRAs begin to phase out at different income ranges for married taxpayers filing jointly, married taxpayers filing separately and singles or heads of households. Please see Roth IRA Contribution Limits above for specific income amounts. Footnote 4 Please keep in mind that an automatic investment plan does not ensure a profit or protect against loss in declining markets. Such a plan involves continuous investment in securities regardless of fluctuating price levels; Investors should carefully consider their financial ability to continue their purchases through periods of fluctuating price levels.